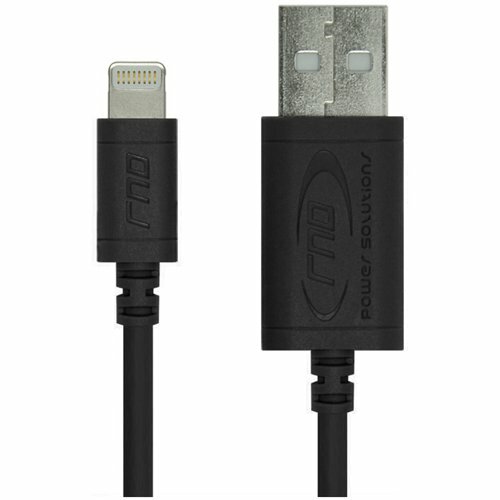 Use RND Power Solutions 8-Pin Lightning to USB EXTRA Long (10ft) Cable to charge and sync your iPhone, iPod, iPad, to your Mac or Windows. Compatible with all Apple iOS and iTunes versions. The cable is made with the highest quality plastic, copper shielding, and nickel plated connectors to ensure fast, stable, and reliable data connections while syncing. Slim Design for the best fit.Our slim lightning connector allows it to be used with the majority of cases including Otterbox and Lifeproof. Our cable can help you charge or sync data by simply plugging into a charger, PC, or Mac USB Outlet. LIGHTNING CABLE - LENGTH: 10 Feet, 3 Meters. COLOR: Black.